"Former Iraqi dictator Saddam Hussein has been executed, a witness said. In the background, Shiite chanting could be heard. When asked about the chanting, the official said "These are employees of the prime minister's office and government chanting in celebration." The witness reported that celebrations broke out after Hussein was dead, and that there was "dancing around the body."" I have nothing to say about this. I can't possibly regret his death, but there's something ghoulish about the reporting today, which was like a death watch. Or maybe I just happened to tune into the news at all the wrong times. I hope everyone who predicts violence in the aftermath of his death is wrong. 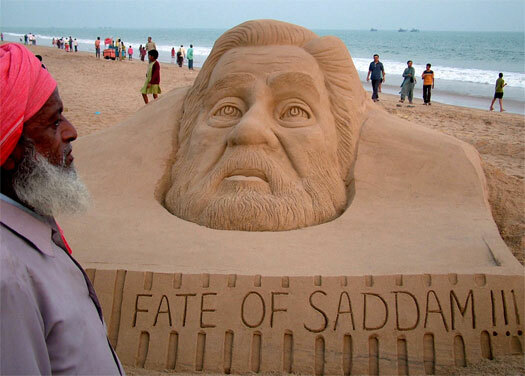 Caption: "An Indian bystander looks at a sand sculpture of former Iraqi President Saddam Hussein on the beach at Puri, some 70kms east of Bhubaneswar." Domestic Violence Drops -- But Why? "Domestic violence rates in the United States dropped sharply between 1993 and 2004 but showed recent signs of a rebound, the Justice Department reported yesterday. The number of domestic homicides fell 32 percent from 1993 to 2004, and the frequency of nonfatal violence between domestic partners dropped by more than 50 percent, from 5.8 attacks per 1,000 U.S. residents age 12 or older, to 2.6 attacks, according to the Bureau of Justice Statistics. The report did not offer an explanation for the trend, but experts said it continued a decline in domestic violence recorded since 1976 and mirrored a drop in violent crime overall in the past decade. Other theories credit increased policing, neighborhood-watch and victim-assistance programs, and awareness raised by the 1994 Violence Against Women Act. Analysts worry that declines may have bottomed out, however. Although overall rates remained unchanged between 2003 and 2004, violence against black women and white men increased slightly." More statistics and musings below the fold. The NYT has a headline that it could have used at any time throughout the last month and a half: "Bush Weighing Strategy Shift on Iraq". "How additional American troops would be employed in Baghdad remains a central point of discussion among Mr. Bush’s top advisers and top ground commanders in Iraq, officials said. But two officials said there was growing agreement that most would not be attached to American teams training Iraqi Army and police units, because doing so would not necessarily yield the quick improvements in security the White House wants." "Consider the process here. It's not that the president has some policy initiative in mind whose operational requirements dictate a surge in force levels. Rather, locked in the prison of his own denial he came to the conclusion that he should back an escalation, prompting the current search for a mission." "As the New Year approaches, we are told that the President is considering the deployment of tens of thousands of additional troops to Iraq in the desperate hope of subduing the burgeoning civil war there. Now we are faced with a quagmire to which there are no good answers. But the one that makes very little sense is to put tens of thousands more young Americans in harm's way without changing a strategy that has failed by almost every imaginable account. In November, the American people sent a resounding message of change to the President. But apparently that message wasn't clear enough. I urge all Americans who share my grave concerns over this looming decision to call, write or email the President, and make your voices heard. I urge you to tell them that our soldiers are not numbers to add just because someone couldn't think of a better idea, they are our sons and daughters, our brothers and sisters, our neighbors and friends who are willing to wave goodbye to everything they've ever known just for the chance to serve their country. Our men and women in uniform are doing a terrific job under extremely difficult conditions. But our government has failed them so many times over the last few years, and we simply cannot afford to do it again. We must not multiply the mistakes of yesterday, we must end them today." I have said this before, but I'm not sure I can say it too often: it is an astonishing thing to have a military willing to accept civilian control: to go off and fight and die without insisting on the right to decide when their sacrifice is worth it and when it's not. It is an extraordinary gift. And if we value it, as we should, we owe it to the men and women in the military to be the best citizens we can possibly be, especially on matters of national security: to be informed, thoughtful, and as wise as we can be, and to make our views known. We owe them this especially when we have reason to doubt that our leaders are exercising the good judgment that people in the military have a right to expect. Because they are not numbers to add just because someone couldn't think of a better idea; and it is not acceptable to ask them to sacrifice their lives not to defend our country against its enemies, but to defend our President against the possibility that he might have to admit failure. A general distrust of my natural enemy -- trialius lawyerius -- does indeed extend to one John "Two Americas" Edwards. So I'll take this opportunity to declare my lack of support for his candidacy. Although I'm looking forward to the day that his agenda of "economic populism" causes him to go Lou Dobbs on all your asses and declare his support for a giant dome over the US to protect us from better-life-seekers and assorted work-wanters (funded, of course, by surcharges on the oil and pharmaceutical industries). UPDATE: Some commenteers argue that without trial lawyers,* we counsel-to-the-all-knowing-all-powerful-big-corporations would be out of work. First, this is an excellent additional reason for Edwards to drop out of the race -- if he's president, he can't sue my clients! (I have a kid now, and I hear college is expensive.) Second, most of my work involves one all-knowing-all-powerful-big-corporation suing another all-knowing-all-powerful-big-corporation. Thus, I would be largely unaffected by the rapture of all trial lawyers to trial lawyer heaven, wherever that may be. Hurray for me! Anyway, this post was obviously tongue-in-cheek -- although, admittedly, I'm opposed to Edward's economic popularism. Economic popularism has tended to lead to poor (but well-meaning!) policy and natavism in the past; the one time that it arguably worked (FDR's New Deal), it actually failed on the economic level (indeed, the New Deal probably worsened the Great Depression). Its success was due to the fact that it-was-better-than-the-communist-fascist-socialist-alternative. Anyway, that's it for now as I have a pressing deadline. Go ahead and crucify me on a cross of gold, or whatever you neo-economic populists do these days. All the best. *Trial lawyer is not synonymous with Plaintiff's lawyer, or even lawyer who tries cases. Indeed, the most successful trial lawyers almost never try cases -- they settle them. (It costs a lot to try a case and most trial lawyers work on contingency.) Anyway, my distrust of trial lawyers comes honestly: I cut my teeth on class action defense, which used to reach levels of near-total-scamdom among certain members of the plaintiff's bar. Simply put, it seems to me that this kind of proxy-based approach to world policy is fairly ill-advised. The tendency in these situations is for the tail to wag the dog and the United States to end up involved in conflicts that have very little to do with actual American interests. Our clearest concrete interest in this matter seems to me to be the presence of a very small number of people involved in previous anti-American plots in Somalia. The best way to obtain those suspects would have been to try to cooperate with the ICU in securing custody over them. Having us instead back Ethiopia's regional ambitions is a good way to serve Ethiopian policy goals, but accomplishes little for the United States unless American interests in the Horn are simply defined as helping Ethiopia do whatever it wants, which is precisely the tail-wags-dog scenario that worries me. The Islamists came to power earlier this year as a grassroots movement that drove out Mogadishu’s warlords and restored a semblance of order to a city that was once one of the most violent on the planet. But the goodwill they earned is being sapped away by their decision to attack the transitional government and declare a holy war against Christian-led Ethiopia. That provoked a crushing counterattack by the Ethiopians, who have the strongest military in East Africa and have sided with the transitional government because Ethiopia views the Islamists as a threat to its own security. Residents in one of Mogadishu’s slums threw rocks at the Islamists’ pick-up trucks today. Ahmed Nur Bilal, a retired Somali National Army general, said the war had been a horrible miscalculation. What made him especially mad, he said, was the Islamists’ reliance on adolescent boys to do most of the fighting. One of the first things the Islamists did after the fighting started was to close all schools in Mogadishu to send more young people to the front. Witnesses to some of the battles said the teenage troops were no match for the better-trained, better-equipped Ethiopian-backed forces who summarily mowed them down. “They’ve misled our children to their deaths,” Mr. Bilal said. "The children" aren't the only ones who are being misled. This should be a no-brainer: Of course we'll help the Ethiopians. Indeed, there'd be serious cause for complaint if the Bush Administration did anything else. More depressing, however, are Yglesias' commentators. They run the gamut from nakedly ad hominem ("Trevino is a genocidal bigot, with a brain, mutant moralism, and connections that make him more reprehensible and dangerous than the Steyns and Hewitts") to the bizarrely off point ("[Trevino's] argument might have been worth considering in 2001 or 2002; we will never know. But Iraq nullifies all this. And if this Trevino supported that invasion that is the only counterargument you need offer; it exposes his insincerity in fighting a 'war on terror'."). And that's only the first two! Yet, Trevino happens to know something about this -- and he happens to be right. Waving one's hands while incanting "the Iraq War" won't change that. And, although someone will surely try to explain it to me in comments, I probably will never understand why it would have been right to support the Ethiopian government in 2001 or 2002-- just not today. The mistake of the reflexively hawkish members of the blogosphere -- your basic Glenn Reynolds (do we have casus belli for Iran yet?) -- is that 9/11 changed everything. It didn't. The ordinary levers of power and military and diplomacy were not magically altered, nor did reality do a two-step. The more lefterly inclined, however, are now making an equal (though opposite) mistake with respect to the Iraq war. And so the idiot-pendulum swings back. The problem is as old as popular rule: difficult times seem always to call forth the Cleons and Niciases from the masses. Ah well. It really doesn't change, does it? The ice in Canada's western Hudson Bay is now breaking up 2 1/2 weeks earlier than it did 30 years ago, giving polar bears there less time to hunt and build up fat reserves that sustain them for eight months before hunting resumes. As local polar bears have become thinner, female polar bears' reproductive rates and cubs' survival rates have fallen, spurring a 21 percent population drop from 1997 to 2004. Scientists have not charted the same rapid decline within the U.S. polar bear populations, but federal scientists have observed a number of troubling signs as the bears have resorted to open-water swimming and even cannibalism in an effort to stay alive. Polar bears normally swim from one patch of sea ice to another to hunt for food, but they are not accustomed to going long distances. In September 2004, government scientists observed 55 polar bears swimming offshore in the Alaskan Beaufort Sea, an unprecedented spike, and four of those bears died. In a separate study that year, federal scientists identified three instances near the Beaufort Sea in which polar bears ate one another." "researchers predict that summer sea ice, which polar bears use as a platform to hunt for ringed seals, will decline 50 to 100 percent. Just this month, researchers at the National Center for Atmospheric Research outlined a worst-case scenario in which summer sea ice could disappear by 2040." As the pack ice recedes, there is less of it for polar bears to hunt from, and polar bears have to swim for longer distances in order to find food. Moreover, one of their hunting strategies is to wait for seals to make holes in the ice in order to breathe and then grab them; if the seals no longer need to make the holes, the bears will have a harder time catching them. "Far fewer polar bears cubs are surviving off Alaska's northern coast, a federal government report released Wednesday has concluded. The study of polar bears in the south Beaufort Sea, which spans the northern coasts of Alaska and western Canada, also found that adult males weigh less and have smaller skulls than those captured and measured two decades ago. A decline in sea ice is a likely reason for fewer surviving cubs and smaller male adults, one of the three researchers said. "We can't say unequivocally that sea ice is the only thing involved," said Steven Amstrup of the U.S. Geological Survey. "There are things we may not be aware of. However, the trends we observed are consistent with changes in nutritional status that are likely to be associated with declines in sea ice. These are the same kinds of trends that we observed in western Hudson Bay, and there we had enough data to determine the decline in sea ice was directly correlated with changing survival rates." The population of polar bears in Canada's western Hudson Bay dropped 22 percent in 17 years, from 1,194 in 1987 to 935 in 2004." "Last spring, three adult females and one yearling were found dead. Three of the bears had depleted their lipid stores, an indication they had starved. The fourth, one of the adult females, had been largely scavenged and cause of death could not be determined. However, her death was unusual, the study said, because prime-age females in the past have had high survival rates." "SCIENTISTS have for the first time found evidence that polar bears are drowning because climate change is melting the Arctic ice shelf. 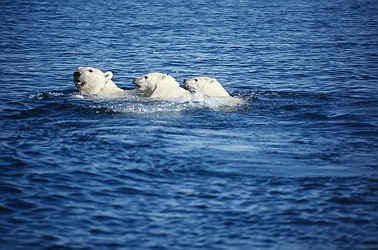 Although polar bears are strong swimmers, they are adapted for swimming close to the shore. Their sea journeys leave them them vulnerable to exhaustion, hypothermia or being swamped by waves. According to the new research, four bear carcases were found floating in one month in a single patch of sea off the north coast of Alaska, where average summer temperatures have increased by 2-3C degrees since 1950s." If this picture was taken from a boat, these bears might have been dying. It is long past time for the US to do something serious about global warming. And while we can try to take steps as individuals, there are steps (like constructing a well-designed system of carbon caps and credits) that require government action. It is, to my mind, appalling that we have wasted so much of what little time remains to us to deal with this problem. "It looks like the president would rather let the whole operation go down in flames than admit he was wrong."" It's not just "the whole operation." It's people's lives. "He is making a vast wager -- of American lives, treasure and the nation's security -- that his judgments about Iraq were right. The Baker-Hamilton report gave him a chance to take some chips off the table, but Bush doesn't seem interested. He is still playing to win. The audience is shouting out advice, but the man under the spotlight knows he will have to make this decision alone." Bush is making a vast wager, but he is not playing to win. He never has been. He is trying to avoid having to admit failure. That's a different matter entirely. He was as open and straight-forward as Nixon was tightly controlled and conspiratorial." That last sentence sums up a lot. Very high praise for a decent man who fully deserved it. "Determined to banish their old tax-and-spend image, Democrats want to shrink the federal deficit, preserve tax cuts for the middle class and challenge the president to raise money for the Iraq war when they take control of Congress next week. But it won't be easy. The incoming Democratic chairmen of the House and Senate Budget committees said they plan to honor a campaign promise to devote billions of additional dollars a year to homeland security and education. And they reiterated a commitment not to cut off funding for U.S. troops in Iraq and Afghanistan. Spratt and Conrad said they would aim to balance the budget by 2012, a goal that could anger liberal Democrats eager for new spending on domestic programs and conservative Republicans determined to preserve the tax cuts passed during Bush's first term. But it also could establish the Democrats as able stewards of the nation's treasury, political analysts said, giving the party's presidential candidates an important accomplishment for the 2008 campaign. "In terms of practical politics, the reality is this: We have to be on good behavior so we have a chance to win the presidency," said Rep. Jim Cooper (D-Tenn.), a leader of the Blue Dog Coalition, a group of conservative House Democrats whose ranks swelled to 44 in the November elections. "We have a chance now of having a new Democratic Party that supports the middle class and has middle-class priorities at heart." Republicans and budget experts say they doubt Democrats can simultaneously cut the deficit and meet their spending goals, especially given GOP opposition to higher taxes. Bush's top budget advisers said last week that they see no need to increase taxes to pay for military operations in Iraq and Afghanistan, which are expected to cost $170 billion this year, up from $120 billion in fiscal 2006." Plainly, the incoming chairs of the House and Senate budget committees disagree with Paul Krugman, not to mention me. Equally plainly, "Bush's top budget advisers", who say that we don't need to raise taxes to pay for the wars in Iraq and Afghanistan, have learned nothing from the administration's six years' experience in fiscal insanity. I have one suggestion to help us balance the budget: don't go along with Bush's plan to increase the size of the Army and Marines. I am not an expert on the military, so I am more than usually open to the idea that I am wrong, but as I understand it, increasing the size of the military would not make any more troops available for around two years (the time it would take to recruit and train them.) If we were planning an open-ended commitment in Iraq, with our present level of troops continuing for the indefinite future, it would make sense to increase the size of the Army and Marines, just as it would have made sense to start adding more troops two (or more) years ago. However, I hope we don't have any such plans, and I would oppose doing anything that would place more military resources at this President's disposal. So the justification for increasing the size of the Army and the Marines would have to rest on our future military needs. We do not need more troops in order to defend the territory of the United States, since there is no real prospect that we will be invaded by any other country, and defending against terrorist attacks or missile strikes does not involve large numbers of ground troops. We do not need more troops in order to inflict very serious damage on any country that harms us -- we have more than enough military resources for that as it is, and we will have still more once we extricate ourselves from Iraq and begin the process of rebuilding and reequipping our army. We do not need more troops in order to respond to a pretty broad range of humanitarian catastrophes -- if we were not in Iraq, we would have more than enough troops to stop the violence in Darfur, for instance. If we need more troops, the reason would have to be: for some future war of choice involving the invasion of another country. We would, for instance, need more troops than we now have if we wanted to invade Iran or North Korea, and to do so without the assistance of other countries. As in the case of fiscal policy, I see no reason whatsoever to believe that the political and intellectual leadership of the Republican party has learned from its mistakes over the last six years. Specifically, there are large chunks of this administration, and of its intellectual enablers, who seem to think that the proper response to any country we have serious problems with is to invade it, and who have been making noises for a while now about invading Iran. They do not seem to have so much as begun to appreciate any of the foreign policy lessons of the last six years: the possibility of containment, the value of diplomacy, the dangers of taking down governments without any real idea of what will happen next, the unpredictability of war and the irresponsibility of going to war except as a last resort, and so forth. Until the leadership of the Republican party shows some signs of having learned something from their failure in Iraq, I think that it would be a mistake to provide them with the means to invade other countries without international support. So I would oppose increasing the size of the Army and Marines even if it came cost-free. "Pentagon civilian officials and military officers said that few were envisioning a large, rapid growth that would require the Army to dust off emergency mobilization plans for reopening bases or drawing in National Guard equipment. Instead, civilian and military officials said, they are drawing up tentative proposals that would make permanent the 30,000-troop temporary increase approved by Congress after the terrorist attacks of Sept. 11, 2001, and then add 30,000 more troops to the Army over the next five years, resulting in an active-duty Army with 542,400 soldiers by 2012. Expanding the nation’s ground forces is expensive; every 10,000 new soldiers add about $1.2 billion in personnel costs to the Pentagon’s annual budget. On top of that, equipment for 10,000 new troops would cost an additional $2 billion, according to Army statistics." So: 60,000 new troops at a total cost of $3.2 billion for every 10,000 new troops: that means $19.2 billion dollars a year for this proposal. (If the $2 billion for equipment is a one-time cost, then it would be $12 billion up front and $7.2 billion a year, plus maintenance and replacements for the new equipment.) All this to provide our government with the resources it needs to undertake ill-advised military adventures, at a time when one party has shown itself to be completely unworthy of being trusted with that responsibility. I think not. This time, I'll opt for fiscal discipline.